The Database Builder is the primary tool for working with data models. It is a purpose built tool that provides a single interface for performing database-related modeling tasks. New data models and databases can be created or existing ones reverse engineered into the tool. The data modeler, database owner or administrator can work within the tool and can connect through to live databases to synchronize the models with the live databases. There is support for most database management systems and connections can be made to production, pre-production, test or development databases. The Database Builder can be used to create new logical and physical data models and to generate databases from these models. The tool can also be used to reverse engineer any number of existing databases into a model, allowing models to be compared and reasoned about. 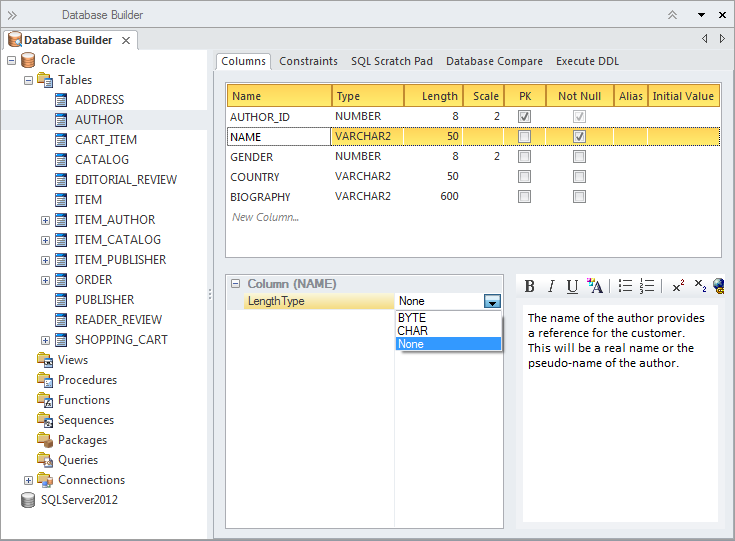 Data elements such as Tables, Views and Stored Procedures that are represented in the Database Builder can be connected to other elements in the repository such as conceptual model elements or Requirements, Use Cases, User Stories, System Components and more. This allows the models to be traced and impact analysis to be performed creating a relationship between these important data representations and the rest of the models. There is a SQL Scratch Pad tool that can be used to develop and execute ad-hoc SQL queries against a live database via an ODBC connection. A Database Compare tool allows a data model to be compared to a live database and if required to be synchronized accepting the changes in either direction. The Execute DDL tools allows Database Definition Language (DDL) statements generated from the models to be executed against a live database and for the results to be viewed and analyzed.